Jason and I recently took the family (all three kids: Noam, Riley and Millie) on our first real full day trip back to Allentown, where we both grew up, to celebrate Rosh Hashanah. I had a lot of anxiety going into the day because, at 2 months old, Noam is still somewhat unpredictable when it comes to handling the car (he usually loves it and falls asleep but he has, on occasion, screamed his head off), meal times (since I exclusively breastfeed I kind of need to always be at the ready) and general disposition (he's usually happy but can get very fussy throughout the evening). Someone must have shared my concerns with him and, being the good son that he is, he decided to be on his complete and utter best behavior (and make me look really good). While it turned out that my anxiety was unwarranted this time because Noam did so well being playful and sweet with the new family members he met, sleeping in the car rides, efficiently eating at perfectly-timed intervals and even handling a drip of caramel on his head like it was nothing - I think I was also able to calm my nerves somewhat by being as prepared as possible going into the trip. Cue the packing list. While it was just a couple of hour car ride and only one day away, we ended up packing up the car with what looked like a week's worth of gear. 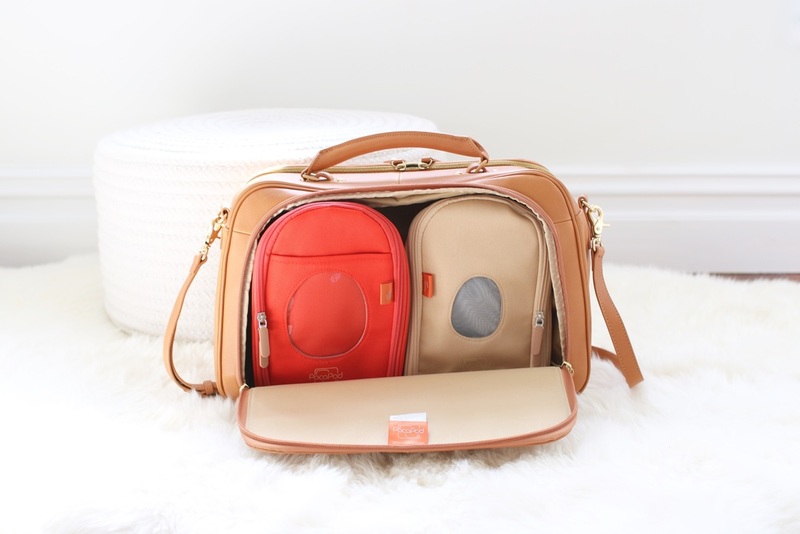 And, since we're actually taking some longer trips in the next couple of months, I decided it was time to invest in a travel baby bag to help us be as efficient and organized as possible. I know, it may seem silly or excessive to have multiple baby bags, but this one is totally worth it. Allow me to explain and introduce you to my first Friday Favorite: the Pacapod. Pacapod is an English company that's developed a simple system for traveling with a baby. They have several different types and sizes of baby bags and each comes with two pods - a changer pod complete with changing mat and an insulated feeder pod with bottle holder. I've fallen completely in love with the bag I ordered, the Madison, and I can't wait to use it for longer trips. While definitely on the pricier side, the Madison is a gorgeous, high-quality bag with all the accoutrements you'd need to feel super prepared for any trip with baby: it's got several pockets and compartments to easily organize your things, straps to connect the bag and pods to your stroller, and a separate compartment for the two ingenious pods. Okay, my ode to the Madison Pacapod is coming to an end, but let me say this first: this post was in no way sponsored or encouraged by Pacapod. I just genuinely love the bag, was excited to have discovered it and felt obliged to share my discovery with you.